As regular visitors to our website will know, at Christmas we make Christmas Elves who have hats. We were asked by a customer to make a Braces Boy with a Christmas Elf hat and we were so pleased with the result that we decided to do a few more. 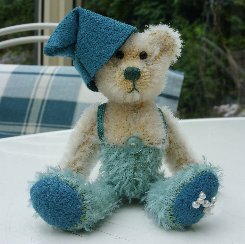 This is Mac Braces, he is 3 1/2" tall and is made of lovely velvety soft, short, cream Schulte mohair with his trousers made of very sparse, short, turquoise green Hembold mohair. We have given him dark turquoise ultrasuede pads, paws and hat, dark turquoise ribbon braces and a turquoise stitched nose. He is steel shot filled for weight and so nice and heavy for his size, he has shiny black German glass eyes and a very pale turquoise belly button. As you can see, he is really very sweet with his cute hat which can be removed if you prefer. I do hope that you like him, he costs £39 plus postage. Please note that as with all our bears, Mac Braces is not a toy and is not suitable for children. Sorry - Mac Braces has been adopted.